If you know about the chef Anthony Bourdain, You probably want to know about his married Life and relationship. He has been married twice; first with Nancy Putkoski and then Ottavia Busia. It is said that ‘Marriages are made in Heaven’ but keeping it safe depends upon the bond and general relationship between husband and wife. His relationship with Nancy did not go well and the couple got a divorce. Later, he got hitched with Ottavia Busia and they have a beautiful daughter together named Ariane. However, this relationship also did not work for Anthony and he got separated from her as well. Let us discuss his personal and professional life. Anthony and Nancy tied the Knot in 1986 after dating several years. After the marriage, the couple stayed together for almost about 20 years. However, Life is not a Fairy Tale and after twenty years of marriage, the couple got a divorce in 2005. Bourdain's extensive travel was seemed to be the reason for the duo’s separation. The pair didn’t have children. 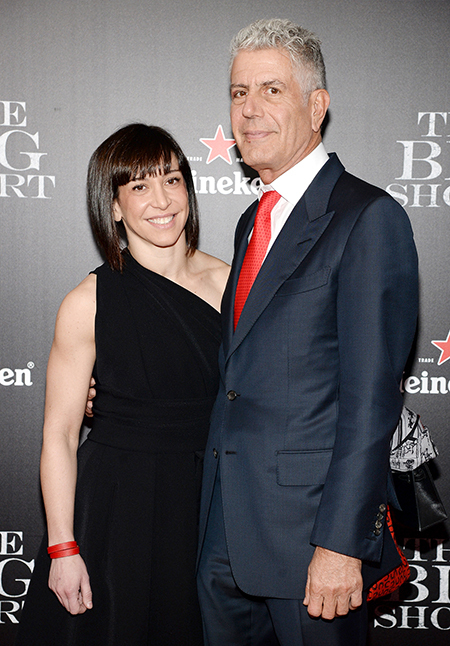 The former couple, Anthony Bourdain and Ottavia Busia. In 2006, the guardian.com interviewed Anthony where he talked about his regrets. He said She was the love of his life but Everything changed. He also regrets not having any children, it’s really amazing that they spend happy 20-years but still have no children. After his divorce, he was addicted to heroin and all other sort of drugs. After a while being addicted and battling with drugs, someone came in his life once again. He once again started dating. She was Ottavia Busia, a mixed martial arts fighter. Anthony and Busia tied their Knot in April 2007 and has a beautiful daughter named Ariane. Once again, the crack came in the life of Anthony and he divorced his second wife. The reason behind the divorce with Ottavia was believed to be the lack of family time as he spends more than 250 days away from his wife and daughter for work. It seems the couple still have a close relationship when Anthony won the Creative Arts Emmy Award in 2016, Ottavia Busia Congratulate him through social media. Huge congrats to anthonybourdain and the whole zpzproduction crew for once again winning an Emmy for Outstanding Informational Series or Special last night!!! An Emmy award winner Anthony is an American Chef, author, and television personality. He went to attend the Culinary Institute of America and was graduated in 1978. From there, he started to run various restaurant kitchens in New York. In 1998, he began as executive chef at Brasserie Les Halles in Manhattan. He also wrote a Non-fiction book 'Like A Cook’s Tour' and 'The Nast Bits'. Similarly, he has also appeared about five Times as a Guest Judge on Bravo's Top Chef reality cooking show. In the year 2015, he appeared in the Movie 'The Big Short', in which he uses seafood stew as an analogy. Till now, with his talent and hard work, he has been able to win so many awards including 'food writer of the year', 'Food book of the year' and much more. Anthony Bourdain died at the age of 61, he found dead of an apparent suicide by hanging in his room at Le Chambard hotel in Kaysersberg.